The family Tachinidae includes more than 8,000 species worldwide and is the most species-rich family of the Diptera. The larvae are without exception parasitoids in the bodies of arthropods. Many species parasitise harmful insects, and the family is thus of considerable importance in agriculture and forestry as well as in a more general ecological sense. In striking contrast to recognition of this importance, the division of the family into systematic subgroups is still at an unsatisfactory level. Many of the groups defined on the basis of adult characters are artificial concepts. For this reason a study has been made of the puparia and cephalo-pharyngeal skeletons of mature larvae, to search for possible constitutive characters and to confirm (or otherwise) the family-group taxa of the existing traditional classification on the basis of synapomorphies. It is hoped that this will be a contribution to the creation of a phylogenetic classification of the family and will also shed light on the systematic position of the Tachinidae within the Diptera. This paper presents the results of the first comprehensive study of the puparia and the cephalo-pharyngeal skeletons of mature larvae of the Tachinidae. It therefore provides a basic introduction to the external morphology of tachinid puparia and of the cephalo-pharyngeal skeleton. Methods of preparation for light microscope and SEM study are described. A comparative study of 261 species of Tachinidae and also of representatives of the Calliphoridae s.l., Gasterophilidae, Oestridae s.l., Rhinophoridae and Sarcophagidae (= Oestroidea part. sensu McAlpine 1989) and of the Anthomyiidae and Muscidae (= Muscoidea part. sensu McAlpine 1989) has been made, and the results of this study are presented here. In separate sections, the general morphology of the external skeleton of the puparia and of the cephalo-pharyngeal skeletons of mature larvae is discussed, with reference to their origin and function. Existing terminology has been accepted for the morphological characters, but new terms are introduced to replace certain inadequate or incorrect terms. Errors in the published literature are corrected. Typological classes are erected and/or transformation sequences formulated for important character states. The hypothetical ground-plan condition for the Tachinidae is postulated, both for puparia and for the cephalo-pharyngeal skeleton. Based on this, 43 subgroups of the Tachinidae and 9 outgroups are characterised according to the characters of their puparia and cephalo-pharyngeal skeletons. A phylogenetic assessment is made of the characters in terms of the ground-plan. Probable paraphyletic groups are discussed, and monophyla are defined. Finally, plesiomorphous and apomorphous characters within the "Oestroidea" are interpreted and their suitability as constitutive characters for higher taxa is discussed. Die Familie Tachinidae ist weltweit mit mehr als 8.000 rezenten Arten vertreten und damit die artenreichste Fliegenfamilie überhaupt. Die Larven dieser "Raupenfliegen" entwickeln sich ausnahmslos als Parasitoide im Körper von Gliedertieren. Viele Arten parasitieren in Schadinsekten. In land- und forstwirtschaftlicher wie auch in ökologischer Hinsicht nehmen die Tachinidae deshalb eine wichtige Stellung ein. Im Kontrast zu ihrer Bedeutung ist der Stand der systematischen Gliederung der Familie unbefriedigend. Die bisher auf der Basis von Imaginalmerkmalen erstellten Gruppen sind häufig artifizielle Gebilde. Deshalb werden die Puparien und Cephalopharyngealskelette der maturen Larven auf konstitutiv verwendbare Merkmale untersucht, um anschließend die Familiengruppen-Taxa der bestehenden traditionellen Klassifikation auf eventuell vorhandene Synapomorphien zu prüfen. Damit soll ein Beitrag zur Schaffung eines phylogenetischen Systems innerhalb der Familie und zur Klärung der Stellung der Tachinidae im System der Diptera geleistet werden. Diese Arbeit ist das Ergebnis einer ersten umfassenden Untersuchung der Puparien und Cephalopharyngealskelette der erwachsenen Larven von Raupenfliegen. Sie stellt deshalb eine grundlegende Einführung in die äußere Morphologie der Tachinenpuparien und der Schlundskelette dar. Für die lichtmikroskopischen und rasterelektronenmikroskopischen Verfahren werden die erarbeiteten Präparationsmethoden beschrieben. 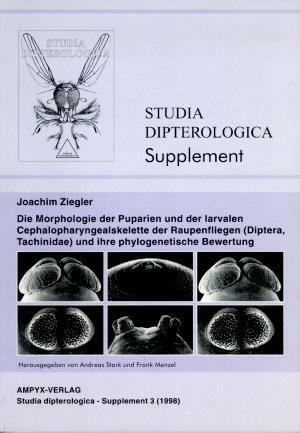 Die Ergebnisse vergleichender Untersuchungen an 261 Arten der Tachinidae und an Vertretern der Calliphoridae s. l., Gasterophilidae, Oestridae s. l., Rhinophoridae und Sarcophagidae (= Oestroidea part. sensu McAlpine 1989) sowie Anthomyiidae und Muscidae (= Muscoidea part. sensu McAlpine 1989) werden dargestellt. In getrennten Kapiteln wird - unter Berücksichtigung von Entstehung und Funktion - die allgemeine Morphologie des äußeren Skeletts der Puparien und des Cephalopharyngealskeletts der maturen Larven behandelt. Für die festgestellten morphologischen Merkmale werden bestehende Bezeichnungen übernommen oder für unzutreffende oder fehlende Begriffe neue Eigennamen eingeführt. In der Literatur vorhandene Irrtümer werden richtiggestellt. Für wichtige Merkmalsausprägungen werden Typenklassen geschaffen und/oder Transformationsreihen formuliert. Das hypothetische Grundmuster der Tachinidae - sowohl für die Puparien als auch für die Schlundskelette - wird postuliert. Darauf aufbauend erfolgt die Charakterisierung von 43 Gruppen der Tachinidae und von 9 Außengruppen nach den Merkmalen ihrer Puparien und Cephalopharyngealskelette. Die gefundenen Merkmale werden auf der Basis des erarbeiteten Grundmusters phylogenetisch bewertet. Wahrscheinlich paraphyletische Gruppen werden diskutiert und Monophyla begründet. Abschließend werden plesiomorphe und apomorphe Merkmalsausprägungen innerhalb der "Oestroidea" interpretiert und ihre Eignung zur Konstitution höherer Taxa diskutiert.